Farley: Second quarter was a milestone. 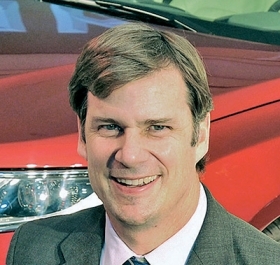 Jim Farley, Ford of Europe boss since Jan. 1, is bullish on the brand's chances to make a full-year profit again after the region nearly broke even in the second quarter. Farley, 53, didn't give a target year for completing the financial turnaround of Ford's European operations, which have been hit by a slump in Russia, where the automaker has invested heavily. He shared his views last month with Automotive News Europe Editor Luca Ciferri and Correspondent Nick Gibbs at the Frankfurt auto show. Q: Ford of Europe lost $1.1 billion last year. How are things this year? A: The second quarter was an important milestone for us: We were near breakeven. The underlying business has improved, and that's before the midsize cars launch. We're on the eve of launching the S-Max and Galaxy [large minivans]. The Mondeo [midsize model line] is starting to grow and those are higher-transaction-price vehicles. We've also become No. 1 this year in [light] commercial vehicles, which are also very important to profitability. The European market is growing, but the health of the growth is suspect from a profit standpoint. Most of the retail growth is happening in southern Europe, which tends to be a lower transaction price. In the more profitable markets of northern Europe, the retail industry is actually flat. It's the fleet and more importantly the rental and dealer self-registrations that are growing year on year. Ford, however, is selling into the more profitable channel mixes. What is the situation in Russia? The real dynamic in Russia is pricing. Unless you're completely localized, the euro/ruble rate is very important. When we saw [the ruble] deteriorate in Q4 last year we saw very large pricing increases. When the customer sees that, some people are going to wait. The question is what kind of pricing are we going to see? We will have to put prices up if the ruble drops. Ford is well positioned in Russia. We've launched four brand-new products, our sales in August were up 17 percent and our share is up a full share point. But, no doubt, it's very challenging. How far will Russian car sales decline? For me, 1.6 million seems like the bottom. It all depends on the government support to the industry -- that's critical. If the government didn't have the [current] scrappage program, then we could see lower industry volumes.